Woolbed was founded in 1995 when we arrived at the beautiful Canary Islands in Spain. Gradually we have been growing and expanding to other destinations such as Palma de Mallorca, also in Spain, Madeira, Portugal, and USA. Taking advantage of the great weather that our destinations provide us, we have achieved agreements with various tour operators and excursion agencies to offer them the opportunity to make a trip with a lower price, thanks to our sponsors, to the most emblematic places in each destination, stopping at our showrooms where we present them our products through a presentation by our experts. We work mainly with Scandinavian tourism. Countries such as Sweden, Norway, Denmark and Finland are among our best customers because we can offer them the opportunity to find all the products for rest with the best quality and guarantee, at a price between 30% and 40% lower than in their countries of origin. We manufacture our products in Germany where many of them are made by hand, and where we have the certification of quality assurance Woolmark. Many of our loyal customers have got to know us by buying through our online store, where they have achieved fantastic promotions or additional products like our own line of Aloe Vera creams. For questions, clarification or personal opinion, you can do it through our contact page and one of our experts will answer all your questions as soon as possible. Thank you for trusting Woolbed. Humans have slept in wool since ancient times. Wool contains a natural grease called lanolin. Lanolin grease is a unique blend of natural waxes and has an amazing ability to have dirt and moisture evaporate from the wool. As the wool always stays dry, the bacteria among the fibers cannot thrive, as they prefer a moist environment. We at Woolbed recommend all with dust mite allergy to sleep in wool as it’s dry environment is the only thing that will help us in our fight against the mites. Mites are a microscopical arachnids that live in our beds and are considered one of the most dangerous pests to humans. They cause most cases of asthma and allergies each year. 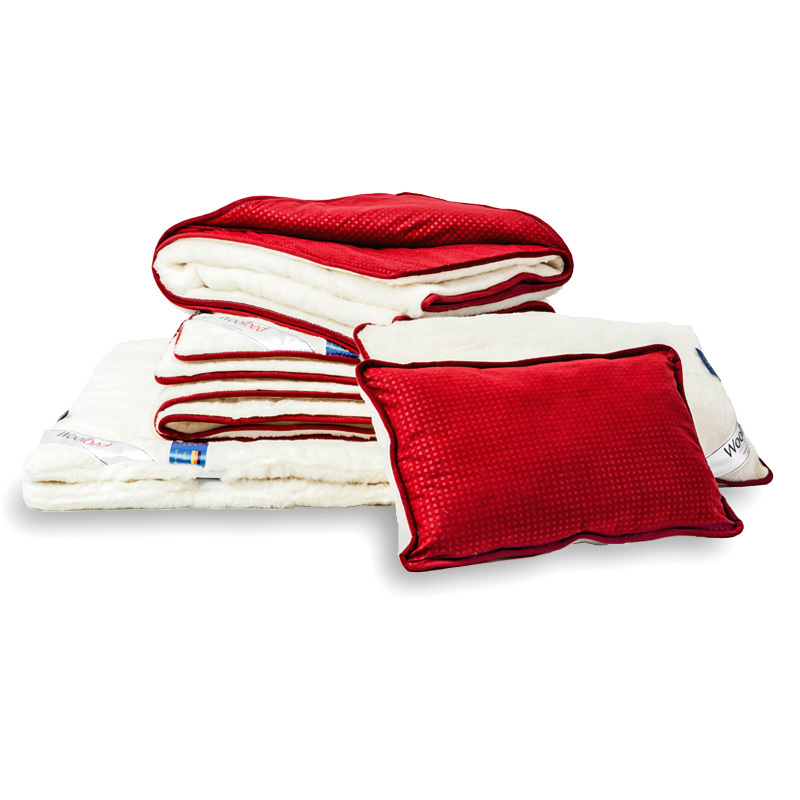 This makes wool the cleanest and the most hypoallergenic material that we can sleep in. Other benefits of wool are that it regulates our body temperature and improves circulation when skin comes into contact with wool, it creates a small friction called micro-massage, which activates our main circulation. Merino wool comes from the merino lamb. The lambs are bred for their wool and are clipped when they are 9-12 months old. Woolbed only imports Merino lambswool from New Zealand. The incredibly soft and silky smooth cashmere, comes from the cashmere goat. They live in cold climates, Tíbet, China, Pakistan and India. The cashmere is combed and sorted by hand, as it is very delicate. Each goat gives about 120g cashmere, hence the incredibly high prices. 1. Before use, shake and ventilate the beding, if necessary, the wool can be vacuumed. 2. Ventilate wool products when needed. Wool does best in fresh and moist air, direct sunlight should be avoided. By hanging out wool in a humid weather it is cleaned in a natural way and any bad odours are removed. 3. Wool can be washed at 86 degrees Fahrenheit (30 degrees Celsius) or in cold water with diluted green soap or wool shampoo. If you get stains, do not wash the whole product but only the stain by hand. 4. Wool should not be left in soaking water, be twisted or brushed. After washing, gently squeeze out excess water. 5. With well used wool products, after several washes, you can add new lanolin available at the pharmacy in spray form. 6. If the need arises, submit the product after 5 years to a thorough washing treatment in a laundry specialized in wool products.